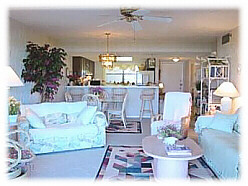 This is a first floor, direct ocean front, 1500SF condo. 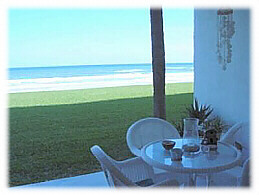 LARGE private patio with white wicker furniture and well manicured green lawn overlooks the beach and ocean. Beautifully designer decorated. Fully equipped (from spices to beach chairs, games, and easel) South end of the non driving pristine beach.... home of the dolphins and sea turtles. Olympic size pool, two tennis courts, shuffle board and picnic area with grill. SMALL TOWN CHARM with museums, lots of restaurants, library, 100 year old archeological sites, boating, shopping, tours, golfing and more. Watch the morning sunrise on your large private patio and watch the sunset standing on the pier at JB's Fishcamp/restaurant one mile down the road. Ocean, Small town, National park location. On the south end of the non driving beach. Home to the dolphins and sea turtles. One mile from the Canaveral National Park. 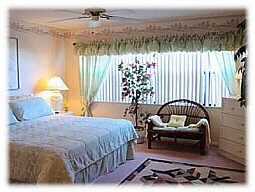 Watch the sunrise from the large private patio and the sunset one mile away on the Indian River side. Large king size bed in master with lots of closets and drawers. Queen size bed in guest bedroom with couch that opens into double bed. Desk and exercise equipment in guest bedroom. 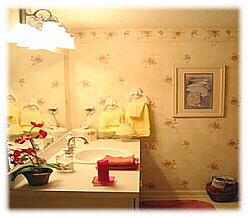 Large private bathrooms beautifully decorated. Large chef's kitchen with breakfast bar and dining room with glass table and upholstered chairs. Looks out on to the ocean. Fully equipped for your convenience whether you're just making coffee, to baking to cooking. This large living room has love seat, recliner, swivel chair, and couch that opens to a double bed. There is a TV, VCR, stereo with CD player and some CDs, and extended digital cable with HBOs. High speed internet access independent of the telephone and cable...books, magazines, board games, and free domestic long distance calling. Looks out onto the ocean. Large private beach patio adjoins living room. Park right outside your front door. handicap parking near front door. Security gated parking lot. All calls in the US are free of charge, High speed internet access, picnic area with grill, tennis courts, shuffle board and pool. This is a no pets/no smoking condo. 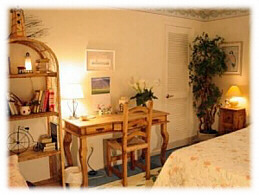 The condo has a panoramic view of the beach and ocean, nothing obstructing the view. Secluded non-commercial area affords great star gazing. Weekly is $950.00 with $300.00 deposit. Email owner for monthly rates.